Can I please have the recipe for the carrot dip, it's one of my favourties. littlej loves the beetroot dip the most. Ok very similar to Pembe Sultan. heat up the oil in a pan and sautee the carrots. Cook for about 5mins. Take off the heat and cool. Add the crushed garlic and salt to the yogurt and beat well then add to the carrot mixture. Stir and serve. If you want less yogurt add less or if you want more add more it is generally personal taste. Hi Simcha, thanks for finding us - and lovely to find you, too, as a result! 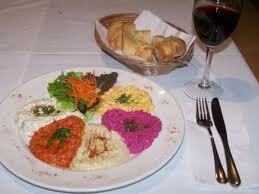 :) Love love love Turkish meze plates! Looking forward to more recipes from you.